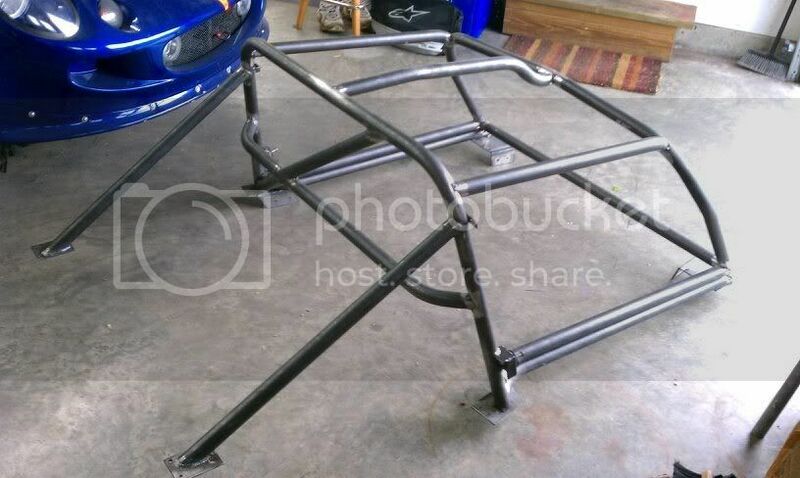 Here are some pre production shots of ourR3 Motorsport new SCCA legal roll cage for the Lotus Elise/Exige. Available either in bolt in or fully welded. We also offer these cages with either welded in side bars or removable and removable knee bar. there goes all my money. Can't wait to see it installed. r3motorsport, just curious: Do you feel that r3motorsport had to make any safety compromises to make this cage for a Lotus? Also, have you had a chance to do many post-crash analysis of similarly designed cages? "Coopers were fun cars, Lotus were winning cars"
I'll have to check my records but I believe there is a place in Georgia that made them. I think he was the original guy making them for HRM cars for SCCA. How the heck can it be welded in? they would be tig welded in.tig doesnt throw sparks all over the place.i seen kurt install a few in customers cars.he was selling a knock down kit that the customer could install too. TIG MIG or SHTIG you CANNOT weld steel to aluminum. Therefore, all SCCA legal cages for Elise/Exige that do not required destructive testing, as per regulations, have to be bolted in. How you do the bolting-in is a very interesting question. If the cage is designed properly, it would significantly increase the stiffness of the chassis. The question about testing is mute. SCCA mandates a certain steel design. They know it works, the tube diameter and thickness is all spec'd out. So are the main hoops and bars. The trick is to use chrome-moly to make it even lighter or stiffer. Most people do not spend the $$ and use mild steel. It has some advantages, as well i.e. does not sheer with sharp edges most of the time. ...The trick is to use chrome-moly to make it even lighter or stiffer. Most people do not spend the $$ and use mild steel. It has some advantages, as well i.e. does not sheer with sharp edges most of the time. All variety of steels have about the same stiffness. You could make it stronger, or lighter, but a heavy mild-steel would be stiffer than a light weight chromoly. Not that it would matter - it is already has a stiff chassis. Would be interested in the weight, and if it available unwelded. Even better would be one that can attach to the existing hoop, as they are removable. They are bolted to the hoop. Who would be a qualified, experienced installer in the Northeast? the forward mounting point is riveted and bonded in.then the tubes are welded into these points.i seam to remember kurt welding his kit onto the stock roll bar.but im not sure on that. Kurts cage design replaces the stock main hoop, the fact that the factory hoop is not one continuous piece of tubing but a combination of welded tube in different diameters makes it not legal for SCCA/NASA, not sure what the stock bar wall thickness is but that might exclude it as well. The main hoop on my S1 was one piece so I first thought I would build off that but the wall thickness was too thin so it had to be replaced with tube meeting the rule book. I see that R3 hasn't responded with how much the cage weighs, that's unfortunate but as you can see it is similar to the cage I built for my S1 which weighed in at 79lbs.